Jewelry is made of things from the earth–like metals and minerals. Or it’s made of animals from the sea–like pearls and coral. But meteorite is one material used in jewelry that doesn’t come from the earth or the sea. 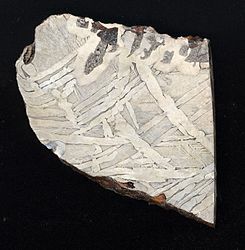 Meteorite is extraterrestrial material, recovered after it hits Earth. It’s used a lot in men’s wedding bands, and its use is starting to seep into women’s pendants and bracelets. What is meteorite made of? Well, it depends on which type you’re thinking about. The three types are stony, iron, and stony-iron. Only 5% of meteorites are classified as iron, but they are the ones that are used for jewelry. These meteorites are primarily iron but contain trace elements like nickel, cobalt and gold. The metal shows a distinctive crystalline pattern when cut, polished, and acid etched. The pattern is the result of slow-cooling iron and nickel crystals. 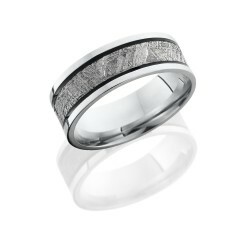 One manufacturer of men’s wedding bands, Lashbrook, uses material from the Gibeon meteorite. The Gibeon material is found near the town of Gibeon in Namibia. Turns out that all meteorites are named for their location. It’s believed the tons of material that showered Gibeon 30,000 years ago is about 4 billion years old. Suppose you want a piece of outer space in your ring. After all, how cool is that? But you should know a few things first. Iron meteorites are magnetic so, if your job is working with magnets, you may want to reconsider. If you have a nickel allergy, you shouldn’t wear meteorite. Gibeon material is about 9% nickel. And, even if none of the above holds true for you, you will want to treat your ring with care. It’s important to never wear it in a pool or hot tub. Because iron can rust, keep the ring dry as much as possible. If you do notice rust, rid the meteorite of any moisture by soaking it in 90% rubbing alcohol and then air drying it. You can clean it gently with a soft toothbrush, and then apply a small amount of gun metal oil, wiping away any excess. Finally, the etch pattern that makes meteorite so distinctive can wear down and become fainter over time. It is possible to re-etch the pattern, however. One thing that surprised me was how many meteorites exist on Earth. Over 40,000 have been found and cataloged. Small pieces of meteorite fall to Earth everyday, but most of them are small and impossible to find because they fall into an ocean! If you want to look for iron meteorite, here are a few tips. Look in regions that are dry and have a barren expanse, like the Mohave Desert or the Great Plains. The black to dark brown color of a meteorite’s exterior, due to the fact that it’s on fire when it enters our atmosphere, is easier to see when the land is tan-colored and without vegetation. Also, the dryness of desert areas helps keep the meteorite from rusting. Use a metal detector to find iron meteorites. And check with the land owner before beginning your search. It’s usually okay to search on public land, but you can’t take any specimens from a National Park. I have only one tip if you want a meteorite ring. 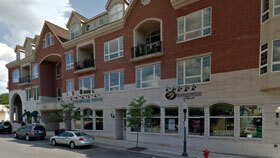 Come to Dearborn Jewelers!! Looking to see what options you have for wedding bands for my partner and me. Meteorite rings are what I’m looking for. Dark or brushed metals preferred. I saw a square ring online somewhere and I thought the shape is unusual and beautiful. Thank you in advance for your assistance. Do you engrave as well? We have additional styles for the meteorite. I hope you are able to come in and see them. And yes, We do complementary engraving for anything that was purchased from us.